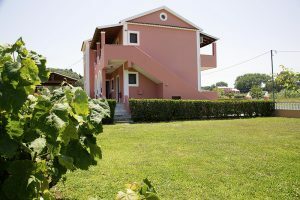 George apts are located in Arillas in a beautiful scenic area at the northwest part of Corfu, only 35 km away from Corfu town & Corfu airport. In Arillas you can find lots of small shops selling clothes, jewellery ,natural products and anything else you might need. At the local restaurants you will find fresh fish from local fishermen and traditional and tasty dishes. You can also enjoy a cool drink and snack relaxing in front of the clear blue sea. The beach is only 350 meters away, a quiet and pleasant walk.George apartments provide comfortable rooms, free wifi, parking and air conditioning.Our priority is the hygiene of our apartments and your stay memorable.